Summer is here in peak performance. And nothing screams summer than smelling the different aromas of grilling. So, I couldn’t wait to put my indoor pan grill to use. A couple of days ago, I purchased a piece of fillet wild salmon. I did a quick marinade of same with a drizzle of olive oil, salt, black pepper, and crushed garlic. I had this sit for approximately half an hour. I heated my grill pan on low to medium heat. 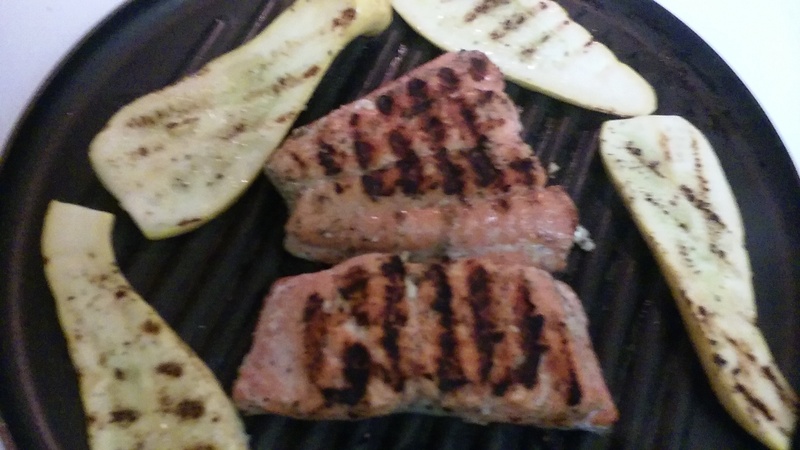 I removed garlic from salmon and placed fish on grill skin side down first.Salmon was cooked for approximately four to five minutes per side. I also got a couple small summer squash in on the action. I sliced these length-wise, brushed with oil, and seasoned with a pinch of salt and black. Grilled wild salmon was served with wedges of roasted sweet potatoes along with nature’s butter (avocado). Of course, because seafood loves acid, I made a lemon/orange/butter sauce with capers. This was used to top fish. I garnished with finely chopped parsley. It was a summer feast. Thanks you so much. It’s always nice having you stop by. Have a beautiful day. Cheers!